Great location and comfortable apartment. Highly recommend. Staff were magnificent We were so well looked after and the kids were treated very special with gifts. The warmth and generosity of all staff members we encountered was outstanding. We’ll definitely be back and recommend the Pullman to our friends and family. Great service but cold shower Awesome location, facilities and service...a cold shower detracted from the experience tho! So close to everything Stayed here whilst family in hospital. Everything is close by with public transport making it all accessible. It has all things needed away from home. Clean and tidy and quiet. Great location, room was clean. Carpet could do with replacing. Staff were friendly. Would stay here again. Been struck down with a bad case FOMO? 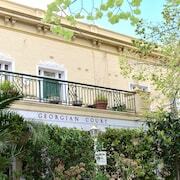 Spoil yourself with a getaway to East Melbourne. 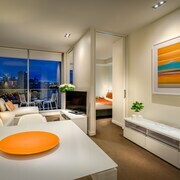 Situated 2 kilometres from the centre of Melbourne, it's an excellent place to stay while exploring Victoria's capital. Start making amazing memories (and taking some brag-worthy selfies) at the Crown Casino and Entertainment Complex, Federation Square and St. Kilda Beach, just some of Melbourne's most incredible sights. Getting to know East Melbourne and the surrounding area usually involves exploring the Melbourne Museum and the National Gallery of Victoria. If you want to stay near the Crown Casino and Entertainment Complex, have a squiz at the AKOM Docklands, Crown Towers, Park Hyatt Melbourne, Grand Hyatt Melbourne and Docklands Private Collection of Apartments - NewQuay. You won't have to drive for ages to reach the Melbourne Museum. Wake up nearby at the Clarion Suites Gateway, Crown Metropol, Mantra Southbank Melbourne, Melbourne Short Stay Apartments MP Deluxe and Tribeca Serviced Apartments Melbourne and have extra time for the fun stuff. Hear the thunderous applause of the crowd when enjoying an event at Margaret Court Arena, regarded as providing some of the best entertainment around. 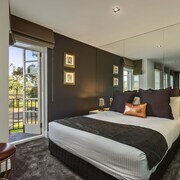 The Caroline Serviced Apartments South Yarra and Art Series - The Cullen are among the best places to rest your head close by. Listen to some talented acts at Sidney Myer Music Bowl. Make sure you check out the schedule. 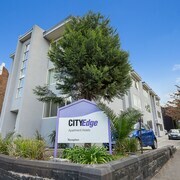 You'll also discover great accommodations within easy reach of this attraction, such as the Somerset On Elizabeth, Melbourne and Quest East Melbourne. What else are holidays for if not splashing out? 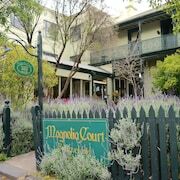 The Mantra on Jolimont and Aberlour Court are lastminute.com.au's top picks for those travellers who aren't afraid of throwing down a few more coins. Why not chat to the gang about booking a hotel in East End Theatre District or Chinatown when planning your trip? 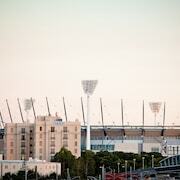 East End Theatre District is 1 kilometre from East Melbourne, and Chinatown is around 1 kilometre away. In just a couple of clicks you can shut down your laptop and start packing your bag for an incredible East Melbourne getaway. We're here to help at every step of the way — just say the word!